The parents of a six-year-old boy have removed him from his primary school in a row over whether another pupil should be allowed to wear a dress. Nigel and Sally Rowe said their son was confused as to why the child at the Church of England School on the Isle of Wight dressed as both a boy and a girl. The Diocese of Portsmouth, under which the school falls, said it was required to "respect diversity of all kinds". 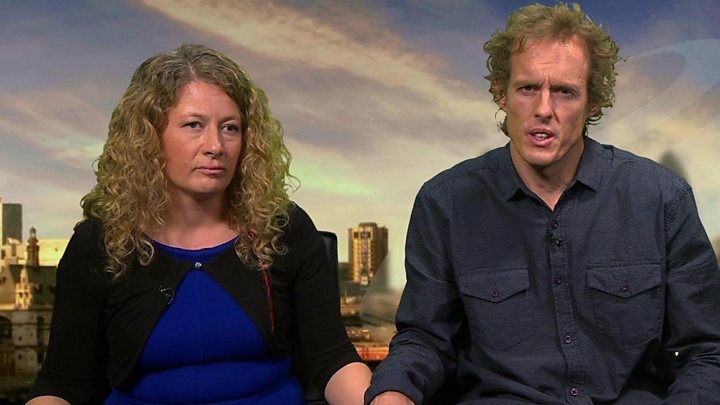 The couple believe the school should have consulted all parents. Mrs Rowe told the BBC's Victoria Derbyshire programme that when they spoke with the school, which is not being identified, they were told "if a child wants to do that then we just have to accept it". The couple said under the school's bullying policy their son faced being disciplined for misidentifying the gender of the six-year-old pupil. Two years ago they removed their eldest son from the same school in a separate row about a different child with gender identity issues. The Rowes say the suggestion that gender is fluid conflicts with their Christian beliefs and they are seeking a legal challenge against the school's actions. The Christian Legal Centre, which is supporting Mr and Mrs Rowe, said the couple were being accused of "transphobic behaviour" because of their "refusal to acknowledge a transgender person's true gender". Mr Rowe said: "I am shocked by the suggestion, especially from a church school, that just because we question the notion that a six-year-old boy can really become a girl, we are transphobic." She added:: "We believe he [the older boy] was under stress by the confusion that was caused by having a boy in his class that decided that they were going to have a girl's name and dress as a girl." There is no specific law dictating uniforms. Schools are free to set their own rules as long as they don't breach human rights and equality legislation; in other words, they cannot discriminate on the basis of gender, race, disability, sexual orientation or faith. Under the Human Rights Act, schools must also make sure that no child is prevented from accessing education due to their uniform rules. It's more common for schools or employers to be challenged over dress codes when people are prevented from wearing something, for instance a hijab or a crucifix necklace, rather than because they have permitted something - in this case for a boy to wear the regulation girls' uniform. This case is unusual because the parents taking legal action are protesting against a form of uniform being permitted rather than prohibited, and because their child is not the party being directly affected by the rules. This is likely to make their case harder to argue. It will all come down to competing rights - for both children to freely access education and not to be discriminated against. Jeff Williams, director of education for the Diocese of Portsmouth, said: "Church of England schools are inclusive environments where pupils learn to respect diversity of all kinds. "Like any other state school, our schools comply with the legal requirements of the Equalities Act 2010. "Among other things, this requires schools to accept the wishes of children and their families with regard to gender identity. It would be unlawful for any of our schools to do otherwise." Mr and Mrs Rowe say the school's handling of the situation did not show proper regard for the possible long-term emotional and psychological effects for the two young children seeking to change gender, or for the confusion and concern caused to other people by the suggestion that boys are not always boys, and girls are not always girls. LGBT campaigner Jane Fae, who is transgender, said Mr and Mrs Rowe had misjudged the issue, as children with gender issues needed sympathy to help prevent them being bullied. She said: "I have a child who took a lot of bullying on my behalf and that bullying was exactly the same: it was parents saying 'we have a right to an opinion' and they told their children their opinion, and having told their children their opinion, their children thought it was open season on bullying my son."